Embattled Australian Prime Minister Malcolm Turnbull narrowly survived a leadership challenge from within his own party Tuesday as discontent with his rule boiled over less than a year before national elections. Turnbull, considered a moderate, declared his position vacant at a Liberal party meeting to force the issue after rampant speculation that the more hardline Home Affairs Minister Peter Dutton wanted his job, with the government consistently trailing the Labor opposition in opinion polls. Party whip Nola Marino told reporters Dutton challenged but Turnbull won 48-35. "The result of that ballot was Malcolm Turnbull was elected leader of the Liberal Party by a margin of 48-35, with Peter Dutton as the other candidate," she said. Asked what Turnbull said after winning, Marino replied the prime minister "thanked his colleagues for their support and will get on with the business now of governing in the interests of all Australians". On Monday Turnbull had declared he had Dutton's "full support". After losing Dutton, a former police officer who ran a powerful department that oversees the country's domestic spy service, border force and national police, quit and moved to the backbench. 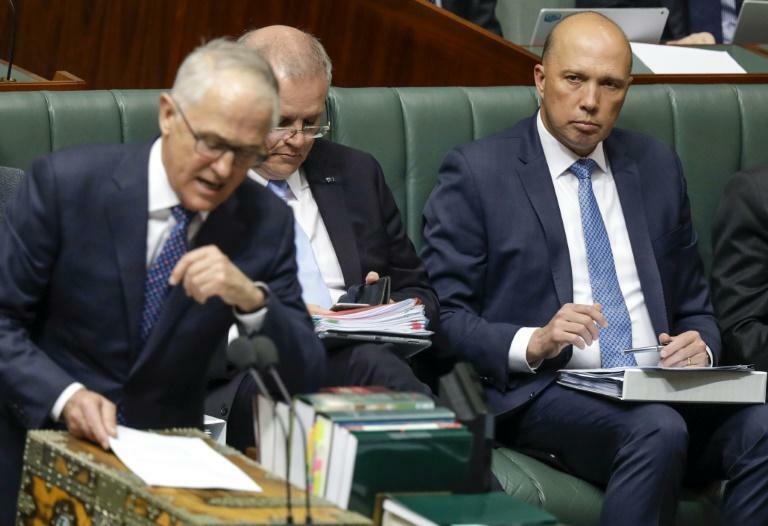 John Hewson, a former leader of the Liberal party who is now with the Australian National University's school of public policy, said Turnbull was wounded and another challenge was likely within weeks. "Abbott wants to get even and Turnbull is now in the tightest of positions. He must stand up for his key polices in the national interest and get out there and argue the case. "When he was elected people expected him to stand up for something, but all he has done with major policies is kick them down the road," he added. Labor Prime Minister Kevin Rudd was ousted by his deputy Julia Gillard in 2010. He later returned the favour and stormed back to power in 2013 shortly before losing the election to Abbott's Liberal/National coalition. Abbott was then unseated by Turnbull. He is now a vocal backbencher and critic of his successor. He argued it should not be enshrined in law as part of the government's new energy policy, known as the National Energy Guarantee (NEG), with consumers facing soaring electricity prices. Disquiet with Turnbull has been building in recent months, with the government trailing Labor in 38 consecutive opinion polls.